As we all age our bones become weakened and we become susceptible to a particular fracture of the spine called compression fracture. It looks like a marshmallow that got smooshed when looking at the spine from the side. Traditionally these were treated with bracing and pain meds plus weeks or months of time. Some people would become bed ridden because of the pain. 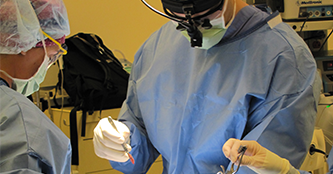 Today we offer patients a procedure that involves the placement of cement directly into the fractured vertebra to stabilize the fracture and perhaps restore some of the smoosh. The level of relief is usually significant within hours or a few days.This is done using minimally invasive techniques as an outpatient with twilight anesthesia.